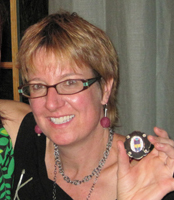 Kristin Lora has been designing and making jewelry and art objects for over 30 years. Inspired by bold shapes and forms, objects, color and movement, Kristin designs unique jewelry, small sculpture and objects to flatter and entertain. These items are created using precious and non-precious materials, such as gold, silver, gemstones, found objects, glass and many other items. Please enjoy viewing samples of Kristin’s work throughout the website. Feel free to contact Kristin at 505-660-0042. Copyright © 1982-2005. All rights reserved.